The truth of the matter is simply that with the workshop looming, my mind has been mostly in the pickle jar for the last little while. I’ve been researching, testing, and making Sarah taste lots of recipes, of late, as I consider what sorts of vegetables I might present to attendees. There have been some significant failures. Fermented zucchini relish will have to go back to the drawing board before it’s — you know — fit for human consumption. But there have been a fair number of delicious, piquant successes, too, that make me cross my fingers that with the cool weather and the unusually late growing-season here in the Mid-Atlantic, the landscape of summer vegetables will hold out through the end of September. Which brings me to this week’s experiment: the herby lactofermented daikons. 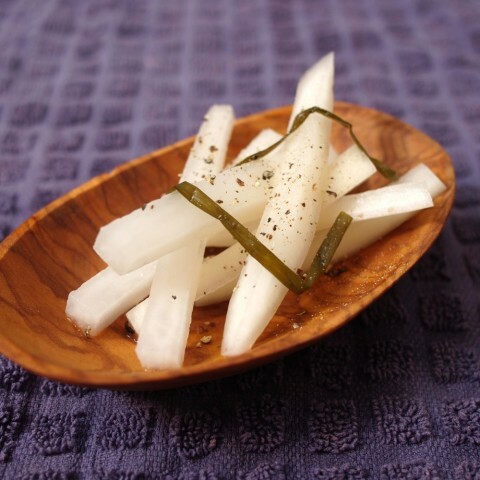 Pickled radishes should actually be pretty familiar to folks who have been reading Twice Cooked for a while. At the end of last year, I did a post on the subject in which I elaborately extolled their virtues. They’re basically sponges, I asserted, soaking up brine — and all the lovely spicy flavors that get steeped in it. And pre-sliced, they’re the perfect flavor-filled convenience food to add to a sandwich, or a salad, or just about anything else you can think of. These are a little bit different from my previous radish endeavor. And there’s a way in which they are, if anything, more traditional. Along with the napa cabbage, daikons are one of the two great bases for making that most iconic of all lacto-pickles: kimchi. 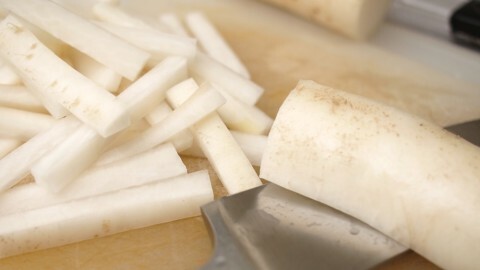 In the words of Lauryn Chun of The Kimchi Cookbook , daikon kimchi, or kkakdugi, features bite-sized cubes of the radishes soaked in a thick, spicy sauce that uses sweet rice flour as its base. It sours to a tangy, almost pineapple-like pickle, she writes, that is boldly spicy and crunchy, and retains its heat after a long wintertime fermentation. My daikons are not those daikons. I can’t offer you a method for making kkakdugi because my recipe belongs to Lauryn Chun. But I wouldn’t be too disappointed if I were you. Pickled daikons in whatever their form are deliciously distinct — at once less sweet, hot, and cabbagy than their pinker, rounder, European cousins. They start off with that familiar radish spiciness, but by the end of their first week of fermentation, it has largely cleared out in favor of a pleasantly eye-opening sour that I’ve found makes a great pick-me-up as an accompaniment to breakfast. 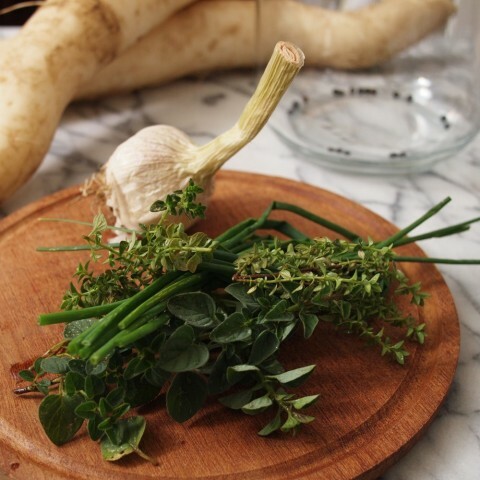 And in this case, with these pickles, that sourness is complemented by a combination of fresh summer herbs — fresh chives, thyme, and oregano — that are subtle (if such a word can be applied to anything pickle-related), but that pervade, adding complexity to every bite. At any rate there will be a recipe in a minute. But I do have one more quick thing before we get down to it. 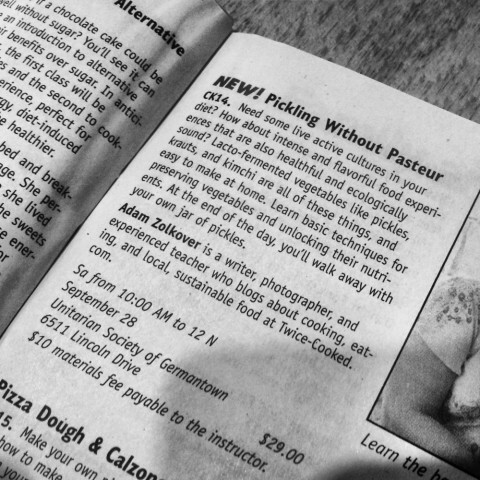 For folks who missed my previous post on the subject, the pickling workshop I referred to at the top of the post is called Pickling Without Pasteur, and I’m teaching it through the Mount Airy Learning Tree on September 28. 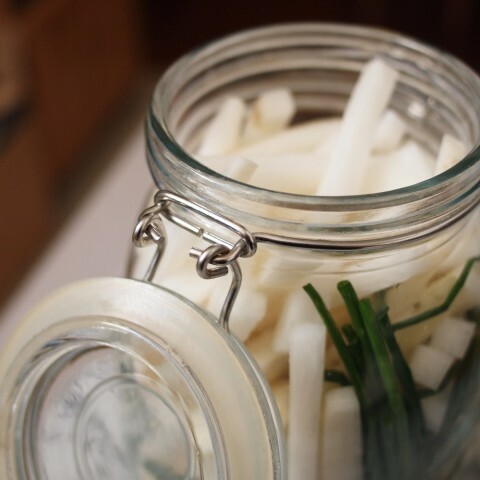 Pickling Without Pasteur costs $29.00 for the two-hour workshop, plus a $10.00 materials fee. You can sign up here, through the Mount Airy Learning Tree’s website. And I’ve just learned that if you use the coupon code NEW13F, you get a ten percent discount because mine is a new course. In a saucepan over a medium flame, combine the water and salt, and heat to a high simmer, stirring until all the solids are dissolved. Remove from the flame and set aside to cool. Thoroughly wash a half-gallon mason jar (or other appropriately sized, lidded container) in scalding hot water with ample soap. Rinse. Dry the outside. Then add all of your vegetables and seasonings to the jar. You’ll want to pack them in to fill the jar to the top. 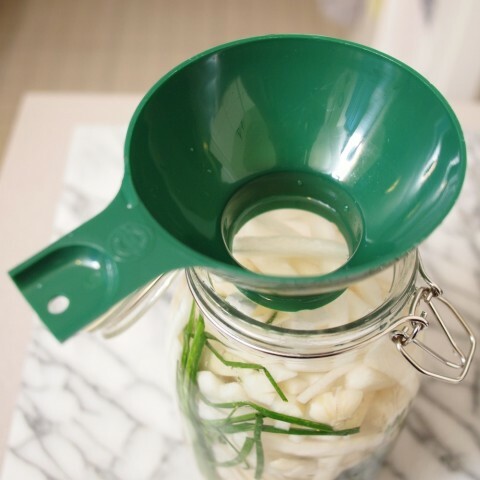 When the brine has cooled almost to room temperature, pour it over the daikons until it fills the jar to the top. Shake the jar to release any air bubbles. Adjust the daikons so that they’re entirely submerged. Then loosely lid it (so that gas can escape), and stow it in a dark place for one to two weeks, until the whole thing has soured. Every twenty-four to forty-eight hours, you’ll want to check on the daikons, give them a stir, and taste them to check on their progress. When they’re sour enough for you, refrigerate them to slow the fermentation.